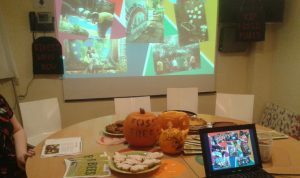 On Monday 31st October we proudly hosted a Halloween themed thank you event in the Warehouse meeting room from 6.30pm until 9pm. 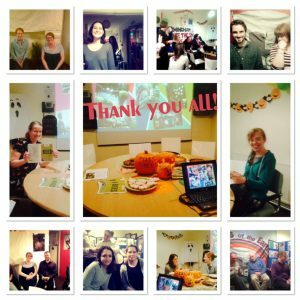 We organised the party to celebrate all that we have achieved this year and to thank our staff, volunteers and supporters who have made it possible. To make an enjoyable evening of doing this, staff, volunteers and supporters gave talks about the main exciting achievements we have made together this year, including the arrival of our own bees and the installation of a public bike pump in New Street station, among others. Photos relating to these were displayed both a slide show and on displays around the room. There was homemade vegetable soup provided by the Warehouse cafe and homemade cakes kindly provided by volunteers. This was an ideal opportunity for those involved with the organisation to socialise and talk about our achievements. The event was well-attended and a great success! 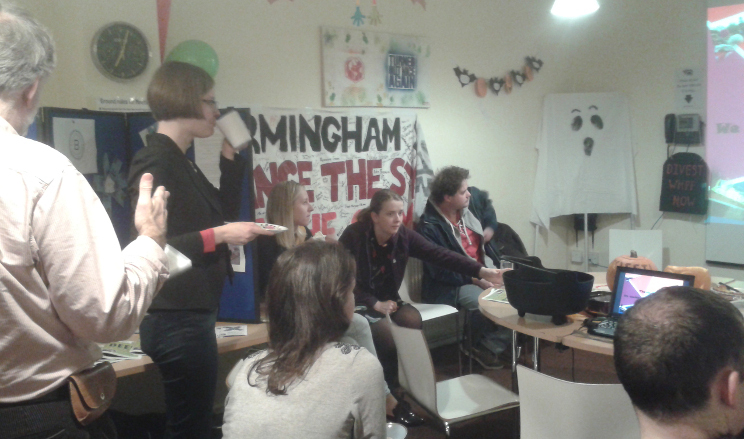 Thank you very much to all those who came and those who brought food and to the cafe for the soup. A big thank you again to all who have made our achievements possible this year (whether you could make it or not to the event). Here’s to another great year for us all!